But the Cork City manager doesn’t understand why the ex-Dundalk boss has been made to wait for the job. 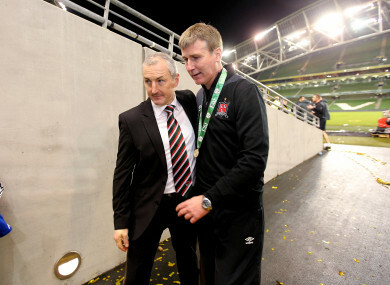 John Caulfield with Stephen Kenny in 2015. STEPHEN KENNY IS a worthy recipient of the top job in Irish football, according to the man who has been his biggest rival. However, Cork City manager John Caulfield doesn’t understand the decision to make Kenny wait until 2020 before taking over as Republic of Ireland senior manager. Mick McCarthy has been appointed to replace Martin O’Neill until the conclusion of the Euro 2020 campaign, after which Kenny will take the reins. Kenny’s six-year tenure as Dundalk manager has already come to an end, as the 47-year-old Dubliner will act as manager of the U21 national team until he succeeds McCarthy. “Regarding Stephen getting the [senior] job, why shouldn’t he? He’s more qualified than most people. He has managed in Europe, whereas a lot of managers haven’t,” Caulfield said in an interview with Denis Hurley for the Evening Echo. “Should he have got it straight off? Personally I think maybe he should have. Maybe they weren’t confident he could do it straight away, I don’t know. Kenny and Caulfield, who often had a fractious relationship, managed the two clubs who have dominated Irish football over the past five years. While Caulfield prepares for his sixth season in charge in Cork, Dundalk are searching for a new boss just weeks after completing a Premier Division and FAI Cup double. Despite not possessing the relevant coaching licence, Vinny Perth — who was Kenny’s assistant at Oriel Park — has been tipped to take over. Crucially for the Lilywhites, they have been able to retain all of their key players for 2019. Caulfield subsequently believes they’re still the team to beat in the SSE Airtricity League. He said: “They have 18 players re-signed that won the double, so whoever gets that job is going in with financially the biggest backers in the country, playing Champions League football. It’s a dream job, because they’re the team to beat. “We’ve lost six or seven players and we’ve had to restructure. We work in a different financial situation. Shamrock Rovers maybe might see this as a big opportunity for themselves. We just have to get back and do what we’ve been doing year in and year out. Email “'He's more qualified than most' - Caulfield backs Ireland appointment of rival Kenny”. Feedback on “'He's more qualified than most' - Caulfield backs Ireland appointment of rival Kenny”.